Performing as Peterkin the Fool, Peet interprets the character of the Court and country fool from early Mediaeval to Jacobean times. 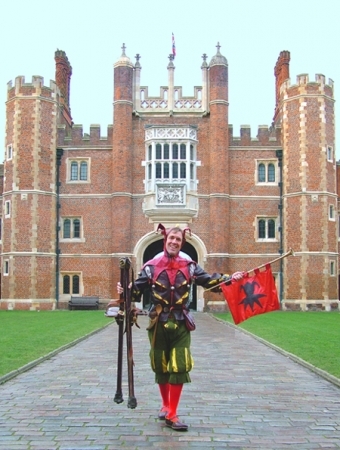 Having worked for English Heritage for whom he is their National Jester, Historic Royal Palaces, Historic Scotland, Cadw, as well as at Windsor Castle, Hever Castle and host of castles, houses and hotels, Peterkin is th efool of choice for the heritage and museum sector. Peet is also creative director of Foolscap Productions for whom he has devised various multi performer pieces for HRP, Historic Scotland and English Heritage. Foolscap are currently working in collaboration with the Misfits Theatre Company on a commission from Historic Royal Palaces to bring an interpretive performance on the role of learning disabled performers in the court of Henry VIII.